I love the color yellow so anything with lemon works for me. Especially with a crumb topping and glaze. This is super simple and absolutely delicious!! 1. In a small bowl, mix crumb ingredients together until crumbly. Set aside. 2. Beat eggs with electric mixer on medium speed until eggs are frothy, about 1-2 minutes. Add sugar and oil, beat until creamy. Add sour cream and buttermilk, lemon peel, lemon juice and extracts, mix well. 3. Stir in dry ingredients until blended. 4. Fill muffin cups 3/4 full. Put 1 Tablespoon of crumb mixture on top. If you make a cake, top with all the crumb mixture. 5. Bake at 375 degrees for 20 minutes or until toothpick comes out clean. 6. Cool for 5 minutes before removing from pan to wire rack. 7. In a small pan over low heat whisk glaze ingredients until lumps from sugar are dissolved. Drizzle over warm muffins. 8. 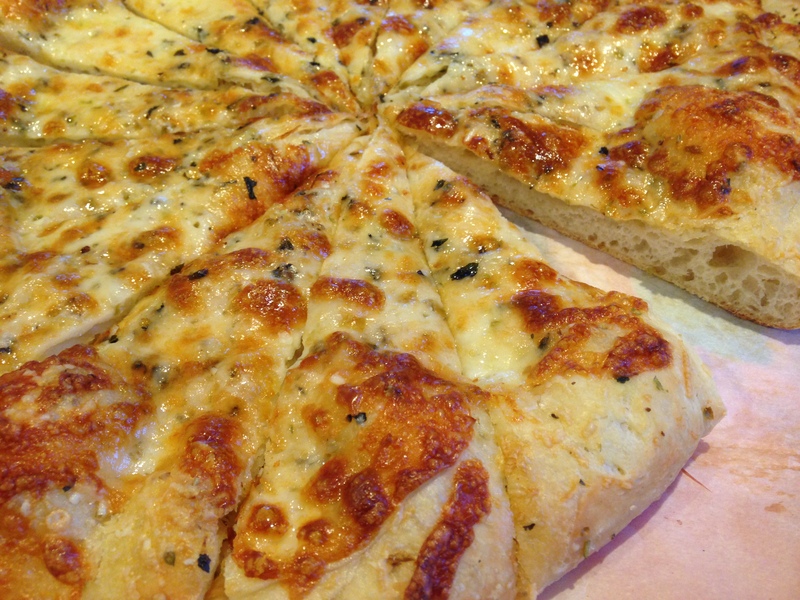 Eat immediately – YUM!! Simple and Delicious!! I saw a recipe last week for Chocolate Cake with Peanut Butter Frosting. I had to whip it up this morning. 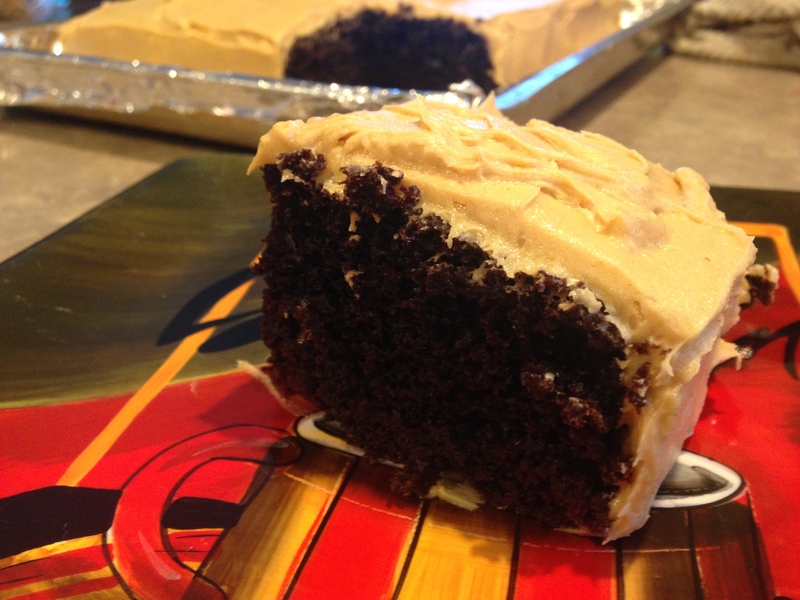 Here is a peanut butter frosting I conjured up. My 3 favorite fats – butter, cream cheese and peanut butter! Combine butter, cream cheese and peanut butter, medium speed. When combined add sugar and mix together. Add vanilla and cream. Mix on high for 30-45 seconds. Done!! So creamy and peanut buttery. Simple and Delicious!! I have been using Hershey’s Chocolate Cake recipe for years. I love it and whenever I want a quick, chocolate fix this is my go to recipe. 1. Preheat oven to 350 degrees. grease and flour the baking dish. 5. Fill your baking dish; 13×9 cake pan or 2-9″ round cake pans or cupcake pan. 6. Bake for 30-35 minutes if using 13×9 pan, 25-30 minutes for round pans and 20 minutes for cupcakes. 7. Remove from oven and cool on wire rack. I saw this quote today and had to share. Carrots or carats don’t really interest me. However, today is National Carrot Cake day. Now that I can relate to! What about you?! 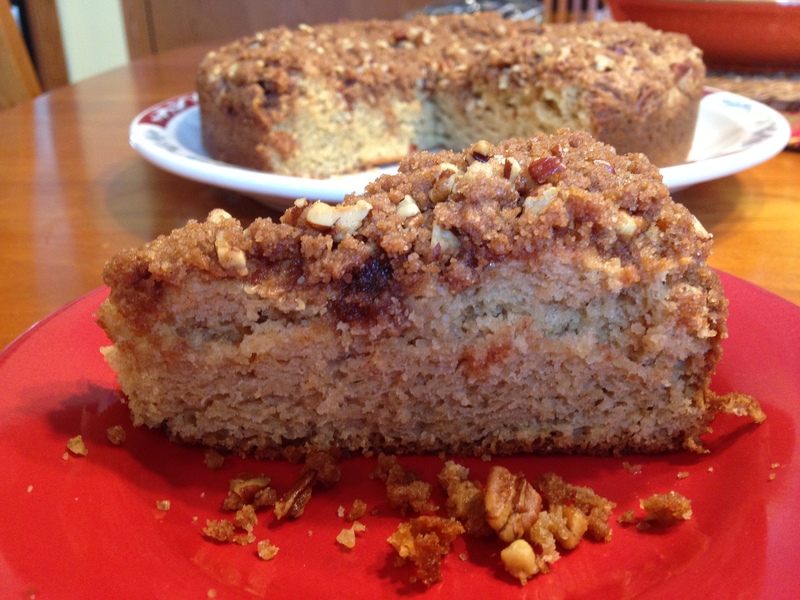 Coffee Cake – Super Easy! 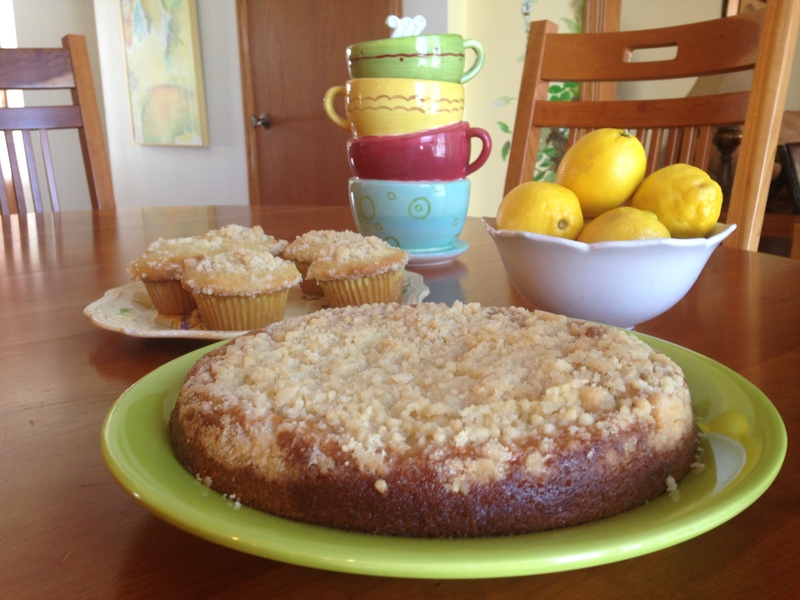 I was checking out Facebook last evening and saw a recipe for Coffee Cake from America’s Test Kitchen Feed Blog. I was going to ignore the urge to make this delicious treat. 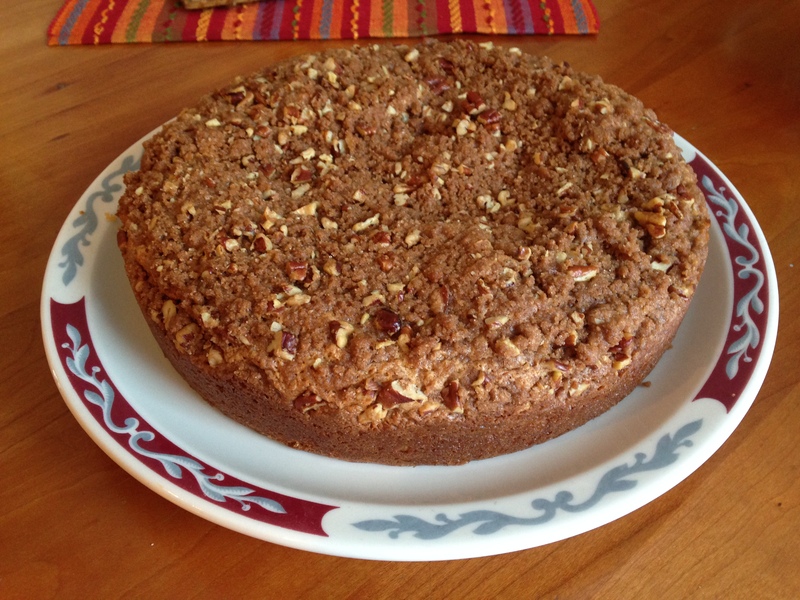 I woke up this morning and the thought of making a Coffee Cake did not go away. So, here it is. Simple and Delicious!! Using your fingers, mix brown sugar, sugar, flour, butter and cinnamon together in bowl until mixture resembles wet sand. Stir in your choice of nuts. 2. Grease two 9 inch cake pans. 3. 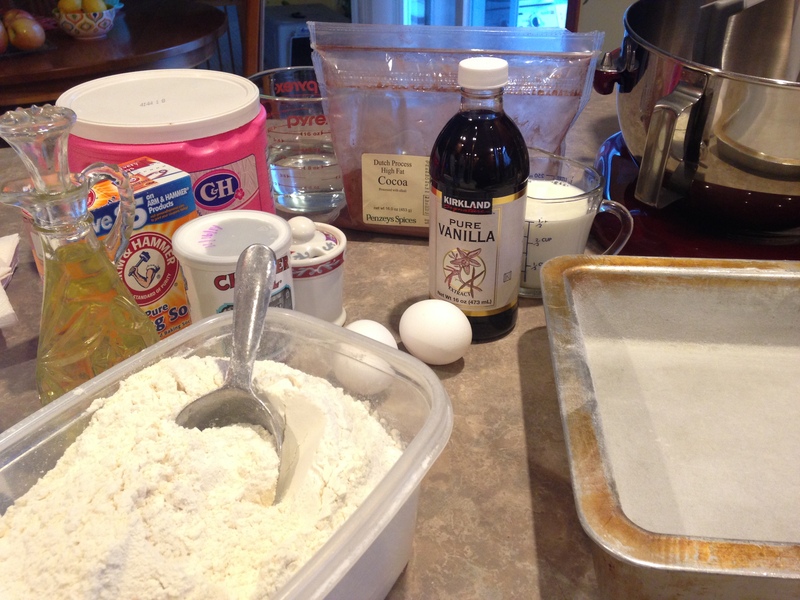 Whisk flour, baking powder, baking soda, cinnamon, and salt together in large bowl. 5. Scrape batter into prepared pans, smooth tops, and evenly sprinkle with topping. 6. Gently tap pans on counter to settle batter. Bake cakes until tops are golden and toothpick inserted in centers come out with few crumbs attached, 25-30 minutes, rotating pans halfway through baking. 7. Let cakes cool in pans for 30 minutes. Serve slightly warm or at room temperature. To make ahead; Portion batter and topping into cake pans but do not bake. Wrap cake pans tightly with plastic wrap and refrigerate for up to 1 day, or freeze for up to 1 month. Bake cakes as directed, increasing baking time 30 to 35 minutes if refrigerated or 40-45 minutes if frozen (do not that cakes before baking).